Cubans who have left the island and crossed the Florida Straits are also discussing what they think should happen back home once Castro has gone. Some of them still think armed intervention is the only way to bring 'democracy'. Others argue that it is through a process of dialogue and eventual reconciliation that change and progress can come. Still others are already planning to invest on the island once it has opened its markets to their products. 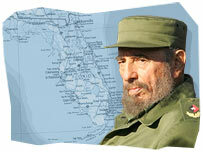 For all of them Cuba and the figure of Fidel Castro remain central to their lives. Meanwhile, the Bush administration has appointed a 'transition co-ordinator' to push forward its own plans for the future of Cuba, with the aim of ending what it calls '47 years of brutal dictatorship'. Just how far is the US government prepared to go in pushing for a regime change?